Crimson Lotus was a collaboration with Damien Echols. Based on his painted "sigils", that are the focus of particular intentions and prayer. Damien typically paints these on wood, and presents them in galleries around the US. For Day For Night we decided to create a room within the space, and display versions of his sigils made out of light. The sigils were made out of LED strips with a tight distribution, and fit within translucent pipe material. They were mounted on temporary walls. Each sigil animated, or "traced" with light as the soundtrack evolved. A projector was mounted in the ceiling and created a rotating circle of moving symbols on the ground. 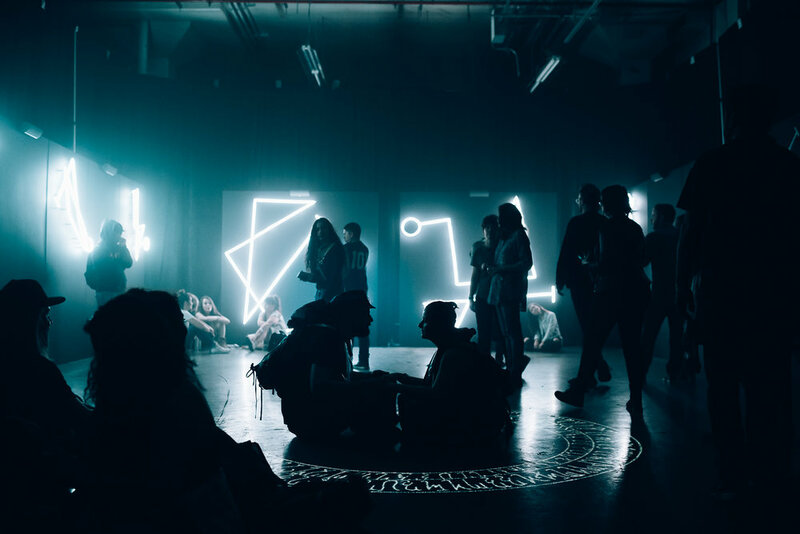 The installation was designed both as meditative/sacred space inside the frenetic atmosphere of the festival, but also as a performance space for Damien. When Damien was not performing, a recording of his voice played, describing the sigils and their meanings. About 3 times a day, he would come out and describe the genesis of his practice creating the sigils, and then guided the audience in a collective meditation.